After the stunning success of the first Indiana Jones film Raiders of the Lost Ark, the follow up (and strangely, prequel) is far less impressive, blighted by pacing problems and clumsy attempts at humour. 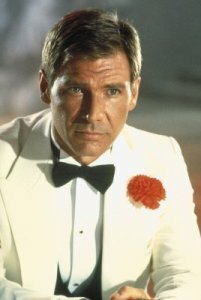 Harrison Ford returns as Professor Jones, archaeologist and adventurer, and is introduced in a Shanghai nightclub completing a transaction involving illicit diamonds and the remains of a Chinese dynastic ruler. After being double-crossed and forced to escape via a small aeroplane that subsequently crashes in India, he and his companions become involved in the disappearance from a local village of all of their children as well as their holy rock, and will face pagan rituals and human sacrifice along with a significant threat to their own lives. Raiders of the Lost Ark is impressive for its pace – the film never lets up from start to finish, grabbing the viewer from first frame until last. It also features several absolutely stunning action set pieces, choreographed to include all manner of enemies and dangers such that they set an incredibly high standard for Temple of Doom to maintain. In this regard, director Steven Spielberg has partially succeeded, with the prolonged sacrifice and escape sequence rather wonderful for its intensity. The problem doesn’t lie with the action, but more with the long and often dull segment between Indy’s escape (with Short Round and Willie) from Shanghai and arrival at the mountainside temple with a heart of darkness. Character information is sparse and disconnected, while the frequent and intrusive attempts at a light-hearted comic tone are brutally ineffective. The knowing wit evident throughout Raiders is replaced by ham-fisted sight gags, and this forms perhaps the weakest component of the film. It isn’t clear why this film was made as a prequel to its predecessor, and the decision to do so adds nothing to the greater narrative about Jones and his world. Temple of Doom seems to fit nowhere, without reference to future events involving the Lost Ark, nor adding substantially to the audience’s understanding of its hero. Explanations for this decision are available but none seems adequate when arrayed against the disconnection the audience experiences by watching two films telling a meta-story in reverse. Special visual effects are more prevalent in Temple of Doom, and thus in retrospect there are more obvious effect failures than in Raiders. Several scenes are blighted for the modern viewer, and while films must always be viewed with attention to their context and their time, there are occasional signs of Spielberg, Lucas and ILM forgetting their limitations and overshooting. Ford is quite reserved in this film, and alongside him Kate Capshaw as Willie doesn’t quite have the impact of Karen Allen as Marion in Raiders. Ke Huy Quan was to follow his appearance in Temple of Doom with a similar turn in The Goonies, and then essentially disappear from the screen. While for many Temple of Doom will remain an 80s classic, it is hard to (re)view it now with the same positive feeling as its predecessor. Clunky comedy and prolonged exposition in the midsection limit the impact of the opening and closing set pieces, and Ford doesn’t have quite the same charm in the role as before. It was to be another five years before Jones would appear on screen again in Indiana Jones and the Last Crusade, perhaps allowing the audience a chance to forget the disappointing after-taste of a film that reduces the value of its franchise instead of enhancing it.